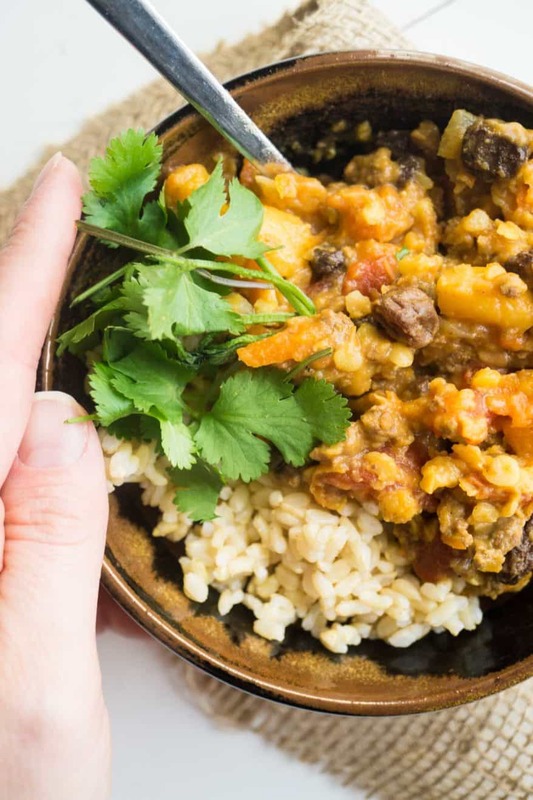 Not too sweet and not too spicy, this Moroccan Beef & Lentils dish knocks it out of the park! Comfort food with a twist [gluten free]. My cooking schedule usually looks something like this: a new dish everyday. I’ve always enjoyed experimenting with new food combinations in the kitchen but this creative side of me has been amped up since I started blogging. My family will never get bored of eating the same thing. In fact, it’s hard for my husband to get me to make his favourite meals since I’m always trying new things. This dish, however, is stellar! I enjoyed it so much I almost feel like I want to make it again this weekend! Almost… then I remember all the other new dishes I want to create…..
Something magical happens when a plant source of iron is paired with meat, poultry, or fish: more iron is absorbed! That’s one reason I love to combine pulses (chickpeas, beans, lentils) with some meat. 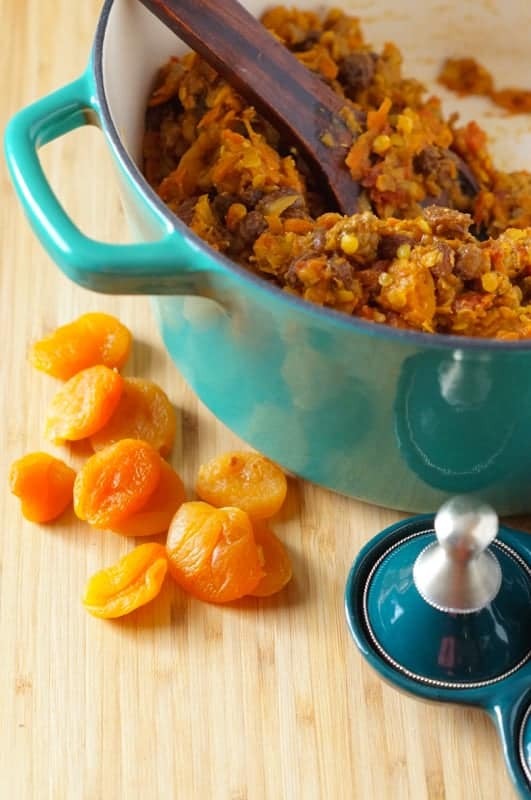 This meal also boasts two other plant sources of iron: raisins and dried apricots. One serving (1/6 of the recipe) has 6.5 mg of iron! The recommended daily amount for adult males is 8 mg and for females it’s 18 mg. This meal also contains a modest amount of Vitamin C (25 mg/serving), which is known to increase iron absorption from meals. In a large pot, saute the ground beef, onion, and garlic over medium heat until the ground beef is cooked through. Add the carrots, spices, salt, and pepper. Cook 1 more minute. Then add the broth, tomatoes, lentils, and honey. Turn the heat down to low. Simmer until the lentils are cooked. Serve over brown rice with a side dish of green beans. Saute the ground beef, onion, garlic, spices, salt and pepper over medium heat until the ground beef is cooked through. Then add the carrots, broth, tomatoes, lentils, and honey. Stir to mix. Select Manual and choose 5 minutes. Use your release method of choice. Add the raisins and apricots and stir. 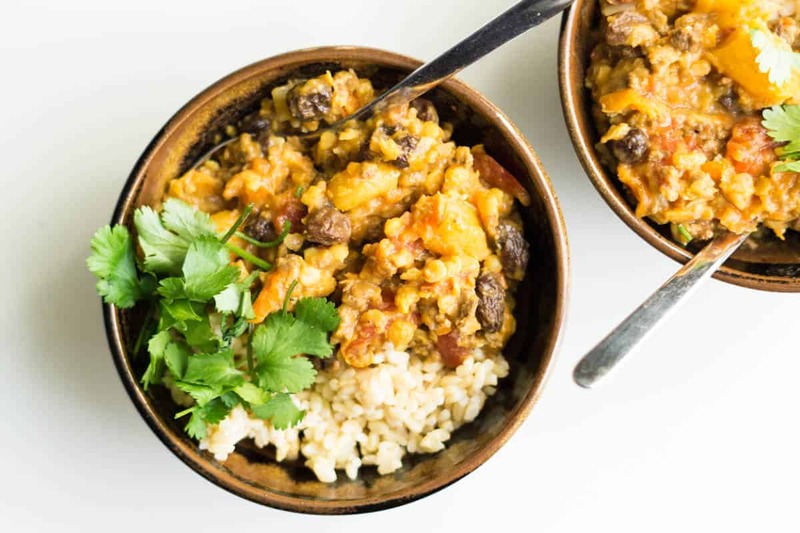 To make the meal vegetarian, omit the ground beef and add an additional cup of lentils and 2 cups of broth. Saute onions in 2 tbsp vegetable oil. Substitute vegetarian broth for the beef broth. To make the meal vegan, also substitute the honey for 1 tablespoon of brown sugar. 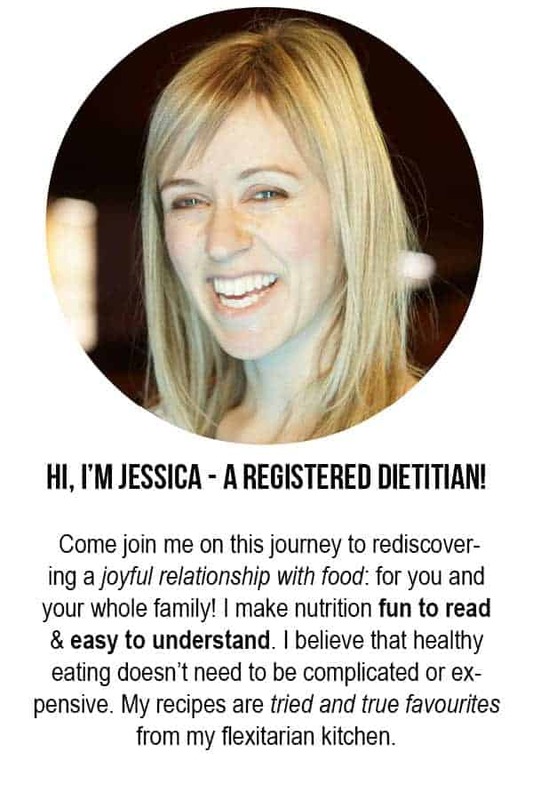 Hi Jessica, just wondering if by coriander you mean coriander seed, ground coriander seed, or cilantro? I looked it up and the internets told me coriander was cilantro …. Good question! This recipe uses ground coriander seed, like you would find in the spice section. I’ll update the recipe to be more specific. Thanks for asking. I ended up crushing the coriander seed I had with a mortar and pestle since I didn’t have pre-ground. This dish was SO delicious!! My spouse’s arabic co-worker asked him “where did you get THAT” and then was like “my mom makes [something similar] for me all the time!” So nice to know it’s recognizable! Tried it tonight and my son actually likes it. He said it was sweet, though and I only added a fraction of the raisins and apricots. Is there something that could be added to kick it up a notch spice-wise?? Other than that, it’s delicious!! Glad you family enjoyed it! I haven’t tried it myself, but maybe adding 1/2 tsp of chili flakes along with the spices would work nicely to kick up the spice! Let me know if you try it. Can I use ground chicken? Trying the ground chicken right now. I’ll leave review later. Thanks. Made it with ground chicken. Didn’t use raisins, I had dried cherries on hand so used that but less. Only like 1/4 cup. Added some extra spices. It was really good. Made this for dinner tonight, and OMG was it good!! A big hit with the family! I made it in my instant pot. I just sauted the meat, then threw all the remaining ingredients into the pot. I added some diced potatoes, celery, a can of diced tomatoes, a 3oz can of tomato paste and a cup of burgandy wine to the rest of the ingredients listed. Hit the “soup/stew” button and 10 minutes later… Viola! Served it over jasmine rice and topped with fresh cilantro. Will definitly be adding this to my favorites! Awesome! Thanks for the review Teresa! Just made this without the sauté step…. Just put it all in the pot and pushed ‘stew’. I did break up the ground beef a little first, but that’s it. Came out perfectly, so easy. Great! Thanks for letting me know how it worked without the saute! Jessica, we will be having this tonight with our Grass Fed Lamb-I will let you know how it is! Yes, please let me know how it is with lamb! 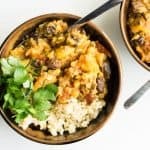 Any way to do it without an instant pot? Yup! There are instructions for both stovetop and Instant Pot! Hi Shelley! Good question! I’ll update the recipe to be more specific. I use split red lentils and yes, they kind of “dissolve” right in. This was very good. Easy and different for dinner. I simmered the stew for 15 minutes before putting in the dried fruit. My husband wants to try it with lamb next time. Like, pieces of lamb. We might also want to add something like chili flakes, or maybe cayenne? We cook low sodium for health reasons, and all I had to do was leave out the salt and use the canned diced tomatoes with no salt added. Thank you! Lamb would be very on point for Moroccan cuisine! This was so good. I added some fresh mint and used currants instead of raisins because that’s what I had. I’ll definitely be making it again!!! Oh I love the idea of currents and mint! Amazing! I would love some guidance on how to release and for how long! Any type of release is fine! I usually do the 10 minute natural release.